Want to dramatically increase the number of your prospects? Develop a lead magnet. 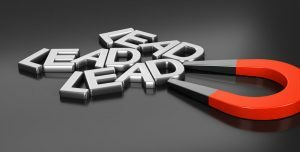 Lead magnets are a great way to expand your prospect list. Basically a lead magnet means you offer people something valuable in exchange for their contact information. Then you can market to these people, turning strangers into prospects and then into customers. They can be used over an extended period of time. They can improve your rankings with the search engines. They can make you stand out in the crowd and become known as an expert. Promises one quick win (so your audience can easily achieve something). Is super specific about its benefits. Is quick to digest (a fact that favors checklists over lengthy reports). Has high value (both perceived and actual). Demonstrates your expertise or your unique value proposition. Some experts recommend offering a tool rather than information. A tool solves the problem simply and quickly. Examples include spreadsheets, a list of WordPress plugins, a calculator or toolbar. One of my favorite tools is the ToTheWeb search-engine simulator, which shows how a web page looks to a search engine. One way to develop an effective lead magnet is Brian Dean’s “skyscraper” technique whereby you take good content and make it better. Among the suggestions: take a good list and annotate it with helpful information. Or communicate the information in a different way (e.g., an infographic summarizing research findings). For other examples of effective lead magnets, see the ebook and white papers examples in my Portfolio page. Choose a compelling topic. You need to offer something valuable for people to give up their contact information. One good source is BuzzSumo, which analyzes the content that is currently trending and the content about to trend. That information can help you choose “hot topics” for your lead magnet. Incorporate search engine optimization (SEO). Determine the major keywords you associate with your business, and capitalize on them in your lead magnet. Consider a different approach. Others may have covered the topic, but you can approach the topic differently. Create a tool. Develop an infographic. Summarize the information in a short video. Pay attention to the look and feel. Better lead magnets look professional. Consider having a graphics artist lay out your material. Revise the lead magnet needed. If it doesn’t attract responses, step back and evaluate it. Ask others for their opinions. It might be you just need a different title or some other tweak. So You Have a Lead Magnet? Now What? Also market the lead magnet on your website, through social media, in your email signature, and in all your other promotional materials. Consider buying ads on Google or Facebook. Write a blog post about your topic, and offer the lead magnet at the end. Stop promoting the lead magnet for a while (“take it off the market”) and then start fresh a few months later. By following these simple steps you will have a lead magnet that can help enlarge your prospect list and expand your business.